The Supervisory Board of Covestro has agreed on an amicable retirement of Patrick Thomas’ tenure as Chief Executive Officer (CEO) effective May 31, 2018, at its meeting held recently. Patrick Thomas contract as CEO would have originally ended on September 30, 2018. Already in May 2017, Patrick Thomas had informed the Supervisory Board that he would not be available for a further term beyond 2018. Subsequently, the Supervisory Board appointed Dr. Markus Steilemann as his successor as CEO of Covestro thus ensuring continuity and a smooth transition. Patrick Thomas has been CEO of Covestro and its predecessor Bayer MaterialScience since 2007. Prior to that, he held various positions across the chemicals industry. Thomas has been taking leading roles in numerous industry associations such as Cefic (Conseil Européen de l’Industrie Chimique / European Chemical Council), WPC (World Plastics Council) and VCI (Verband der Chemischen Industrie). Furthermore, he was President of PlasticsEurope from 2011 to 2017. Patrick Thomas is also a member of the global jury of the ‘Young Champions of the Earth’ competition, an initiative by the United Nations and Covestro for young people to showcase innovative projects to save the environment. Dr. Markus Steilemann, currently Chief Commercial Officer (CCO), will succeed Patrick Thomas, as announced already in May 2017. 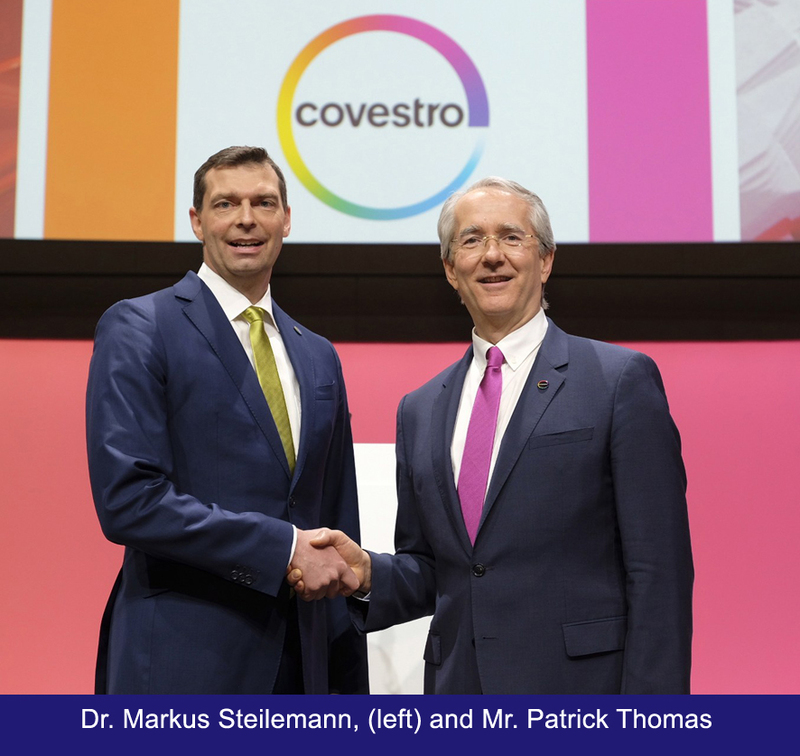 With the retirement of Patrick Thomas and Dr. Markus Steilemann becoming CEO of Covestro, the company’s Board of Management will consist of three members. Dr. Klaus Schäfer, whose contract has been renewed in January 2018 until the end of 2022, will continue to act as Chief Technology Officer (CTO). Dr. Thomas Toepfer, Covestro’s new Chief Financial Officer (CFO), came into office on April 1, 2018.